Yesterday, the newly-formed “Campaign for Accountability” (CfA) sued the SEC in the US District Court for DC for failing to act on the rulemaking petition submitted last year by the Citizens for Responsibility and Ethics in Washington (CREW). Interestingly, this lawsuit is not filed by the folks behind the much more popular rulemaking petition on this topic, the one submitted by Harvard Professor Lucian Bebchuk in 2011 that attracted more than 1 million comments in support (although CREW submitted this letter last month supporting that older petition). On May 12, Senator Richard Shelby, the Chairman of the Senate Committee on Banking, Housing, and Urban Affairs, announced that the Committee had released a draft of “The Financial Regulatory Improvement Act of 2015.” The Committee also issued a section-by-section summary. Senator Shelby said, “this discussion draft is a working document intended to initiate a conversation with all members of the Committee who are interested in reaching a bipartisan agreement to improve access to credit and to reduce the level of risk in our financial system. I look forward to engaging with members of the Committee on specific proposals in the discussion draft.” Democrats on the Banking Committee, including the senior Democrat, Sherrod Brown, have agreed to some changes that provide regulation relief for small banks and credit unions but in public statements have opposed broader changes in the draft bill. Senate Republicans require a few Democratic votes in order to reach the 60 necessary to go to a full vote. Observers expect discussions about the bill to continue for several months, with significant changes to the draft before the bill is brought on for a full vote. 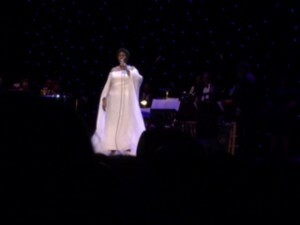 I was lucky enough to see Aretha Franklin & her 30-piece orchestra last night. Like watching royalty. Sounds great at 73!